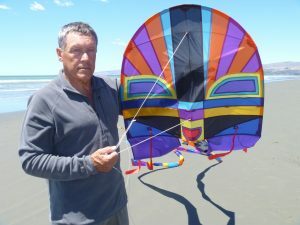 Although I am a fairly recent convert to kite-flying, and left it until quite late in life to start, I now own a very large collection of single line kites, and a couple of two-line ones, and have accumulated many, many hours of flying experience. I go out every day throughout the year when the weather is even halfway suitable. I live in Christchurch, New Zealand. Although the winters are cold and we have been badly affected by earthquakes since September 4, 2010 and particularly the deadly one on February 22, 2011 (with occasional shocks continuing now into 2017 and repairs still not finished,) I have still managed to fly on average at least three times a week. Most of my flying is done on the beach, which is the most convenient open space within a reasonable distance. It also has the benefit, during the summer months, of fairly reliable on-shore winds. 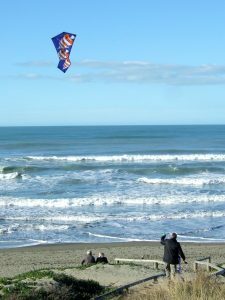 Although I’m no expert, I would like to pass on some thoughts and advice that may be of interest to other adults who are just starting out, or considering doing so, in the field of kite-flying, and so I created this web-site. You may find useful advice on the “General advice” and “Flying” pages. The majority of my many kites have, in the past, been bought from America, as it is impossible to buy them here. I now buy increasing numbers from China, and some recent ones from Germany. My recommendations on where to buy can be found on the “Buying” page. 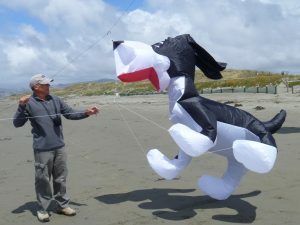 I have made a page with reviews of kites and accessories, which I plan to add to as time permits. (Now up to four pages!) I hope these can be of use to potential buyers, but they are based solely on my experience with those kites and other opinions may, of course, vary. If you have any comments or questions, please email me at [email protected] and I will do my best to reply. But remember that I am no expert! Please note that I fly for fun, and provide my reviews, photos and videos solely to encourage others to take an interest in the great hobby of kite-flying. I do not get any form of payment or sponsorship for this, so please don’t expect too much. And please do not misuse my work. I have had several retailers try to use my videos on their websites without permission, and that tends to make me very angry. 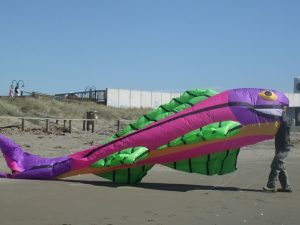 Most kite manufacturers (Into The Wind are a prominent exception) seem to do very little to promote their products, and are content to let others (like me!) do most of their work for them, but without offering anything in return. It’s hard to feel sorry for them when they complain of falling sales, but it’s sad to see that a lot of good kites are no longer available.